Happy Wednesday guys! Last night I made these walnut Christmas ornaments which I think is such a good little activity to do during Christmas time. It’s so lovely just to sit down and get crafty. I normally don’t have or make time for doing crafty activities and I think it’s nice just to get into it and get absorbed whenever you can! Having some tea or a glass of wine along the way and watching Christmas cooking shows at the same time makes this even more enjoyable. We used to make these walnut ornaments when we were younger and I thought we needed some fresh ones to fill up the Christmas tree which is more bare than usual as we have kittens running around and jumping up the tree so don’t want to risk putting up too many glass ornaments! This is a great DIY activity to do with kids too as its not too hard, especially painting the walnut part. I’ve used a pale gold paint however you can use any paint you wish! I would recommend though using one which does have a metallic finish, perhaps a red, green or silver one. That way they match the other ornaments on your tree. It’s nice to make around 20, but you can definitely do less! It’s always faster to do it in a group too. I’ll also be posting a video soon on this to show you guys the steps. Otherwise just follow the steps I’ve written below and check out the videos! Drill a small hole into the walnut. Drill it at the top, flat area of the walnut using a drill beat. The size is shown above in a picture. Once you have a hole, create a loop with the gold string and insert the two separate ends together into some glue and then into the hole. Use a matchstick to seal the top by adding more glue. Allow to dry at least 5-10 minutes (depending on your glue). Also I would recommend cutting all the gold strings at once using the first one to refer to. 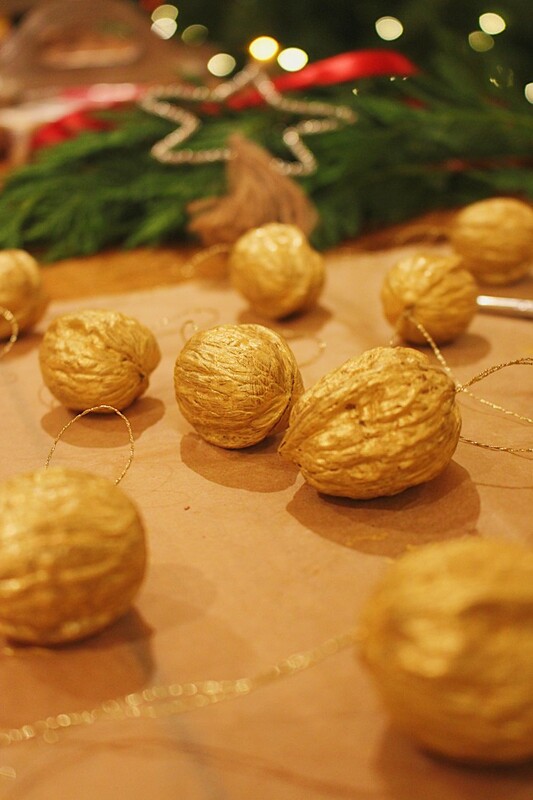 Using a paintbrush, paint the walnut with a good layer of gold paint on the first side. Allow the first side to dry by placing it onto the baking paper and continue on by painting each walnut – half side only. Go back to the first walnut which you started painting (it should be dry by now) and paint the second side of the walnut, continuing with all the rest. This step is great to do for kids as it involves just painting. Place onto the baking paper to dry really well – at least 30 minutes. Then they are ready to hang on your christmas tree! Or pack them away into gift bags or other wrapping which you can give as a gift for friends and family. They are great to make!